Research has elucidated various “performance genes” that have a moderate impact on an athlete’s true potential. Yet an endurance athlete’s risk for injury may still be found on the chromosomes. Although still in its infancy, genetic testing can provide athletes and coaches with information to guide their training and nutrition. In particular, the last several years have seen an increase in research regarding the rate of soft-tissue injury as related to genetics. The specific genes in question are responsible for the correct production of collagen, the body’s major structural protein. Essential for the health of all connective tissues, collagen is a long, thin fibrous protein that possesses remarkable ability to resist tensile stress. 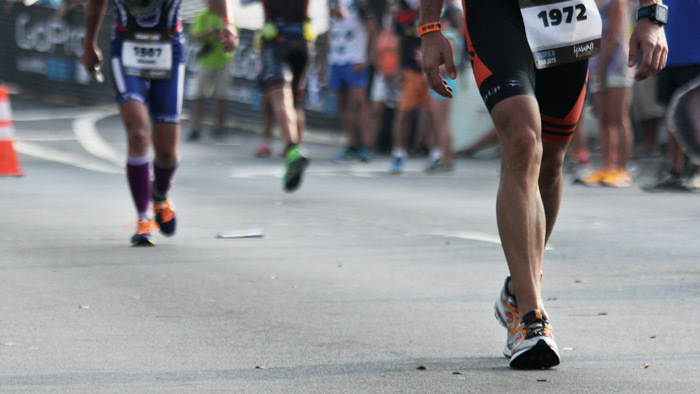 This is especially important for tendons, ligaments, and articular surfaces (joints) that are often the site of injury in runners and triathletes1. Genes that potentially have some performance advantage do exist and will continue to be found, but currently have limited utility. Examples such as ACTN3 for power-related performance and the gene that codes for angiotensin converting enzyme [ACE] for endurance have both shown some promise as predictors of ability. In a similar manner to VO2 max, the ultimate expression of one’s genes mixed with external factors, one’s phenotype, is a beautifully complex process layered with intricacies2. By no means are the developments in genetic testing for athletic ability going to quickly replace more traditional tests. In fact, early adopters of this analysis will need to use the results with prudence and caution3. While I see much well-founded resistance to the implementation of genetic testing for determining athletic capacity, I believe utility for practitioners exists for precautions related to injury. Originally, one of the two genes highlighted below was associated with endurance performance. In fact, it was an SNP (single-nucleotide polymorphism) in that gene that actually coded for an imperfect collagen molecule thought to aid in elastic recoil of the soft tissue. Dr. Michael Posthumus and his team in Cape Town, South Africa published research in 2011 that significantly correlated endurance performance in Ironman triathlon with the expression of a particular SNP of the COL5A1 gene coding for type-V collagen4. His team postulated that as this gene is expressed, the result is a reduced range of motion. This causes a reduction in work due to improved elastic recoil of the soft tissue (e.g. in the Achilles’ tendon or the hamstrings group). Interestingly, while the mechanism of performance association has been called into question by more recent research, interest has increased from those dedicated to the prevention and treatment of athletic injuries5,6. COL5A1 and COL1A1 have both shown significant correlation to soft-tissue injury and both have been implicated specifically in Achilles’ tendinopathies7,8. So far it has been revealed that those with the TT genotype of the COL1A1 gene are unlikely to experience tendon or ligament injuries9. A different version of the gene is associated with a protective, higher bone mineral density as compared to athletes with cruciate ligament ruptures, shoulder dislocations, and Achilles’ tendon ruptures10. For COL5A1, the most common combination of alleles appears to confer resistance to soft-tissue injury through an increased age-related range of motion11. One of the less common genotypes is both associated with improved endurance running (as reported by Posthumus), but is also associated with the less well-organized collagen fibers that may result in higher propensity for Achilles’ tendinopathies. While I fully contend that genetic factors are a small part of the whole picture, I find that at least some of these markers increase a coach’s understanding of an athlete, especially if they are actionable. Once an athlete presents me with a genetic profile associated with altered collagen (or in the case of soft tissue injury and clearance from physical therapy), I will implement extra protocols to ensure proper, effective tissue loading. Even if an athlete’s genes do potentially promote less than optimal synthesis of the molecule, mechanical loading in the proper motions will promote release of metabolic and growth factors, tendon blood flow, collagen synthesis, and proteolytic enzyme activity12,13. In the specific case that an athlete shows a genotype suggesting increased propensity toward Achilles’ tendinopathy and running economy is a priority for the athlete, the focal points for prehabilitation training will be mobilization of tissues needed for optimized economy (hip flexors, anterior shoulder musculature, and ankle, for example) and systematic increase of the integrity of the Achilles’ tendon at end range of motion. The modalities associated would include slow eccentric loading of the gastrocnemius and soleus, including small bounces at end range of motion, myofascial release (either self or through manual techniques), and movements emphasizing fascial integrity and coordination14. In our lab, we still conduct practical, solidly researched tests such as VO2max, lactate threshold, and metabolic efficiency for determining athletic capacity. We still find the applicability of these tests to exceed most any other. On the other hand, I find that new modes of testing are gaining traction and are quite exciting. Granted, no test is complete and each is wrought with its own set of limitations and imperfections. In preparation for writing this article, I read several articles on the debate surrounding the utility of genetic testing as related to performance. The debate tends to center around 1) young people and the impact “performance gene” information may have on their sport of choice and 2) on the potential discrimination by amateur and professional sport organizations on the basis of genetics15. Certainly maintaining perspective on genetic testing and its potential impacts is critical. However, this debate extends far beyond the individual as national sport governing bodies and professional sports teams are utilizing genetic testing for talent identification, injury prediction, and training prescription16,17. Ultimately, an athlete’s abilities are not genetically determined in whole, but are a complex combination of innumerable factors. As a physiologist, I am enticed by the possibility of seeing deeper into the underpinnings of these influences. More of these factors will also become actionable as the research improves, but interpretation and implementation will require objective guidance and reasonable perspective. Thank you to Meghan Lambert, current NTC intern from Purdue University, for her contributions to this article.